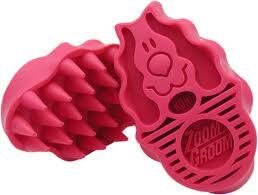 Imagine, if you will, a dog brush that is pleasing to hold, with a satisfying weight and tactile sensation in the hand. A dog brush that can be used on dogs with very short coats, dogs who shed way more than you'd expect but who don't tolerate the harshness of metal brushes. A brush that makes a dog positively go limp in dreamy pleasure, where other brushes make the same dog cringe and slink away at first opportunity. That right there describes the Zoom Groom. I finally got around to purchasing one of these bad boys and tried it out immediately on Lamar and Fozzie. Lamar, who usually runs away when I approach him with a metal slicker brush or the dreaded Furminator, gently wagged, then slowly slumped and stretched out contentedly as I started to brush him with the Zoom Groom. The firm, flexible bristles adhered to Lamar's fur while they gently massaged his skin. Fozzie's fur is so short that I would never use a metal brush on him. I loved having a brush that felt so gentle and kind to use. Like Lamar, Fozzie visibly relaxed as I brushed him, eventually stretching out long so I could reach every part. We got a surprisingly hefty handful of fur that would otherwise have ended up on my couch or in my mouth. It is so wonderful to have a dog brush that brings my dogs pleasure and no stress. We heartily recommend the Zoom Groom for dogs with shorter or medium-length fur! Thanks for the review. Bert gets one of those next time I see one. Finn dreads the furminator! It's great that they have this for shorter-haired doggies. This is what we use! Ours is green and we concur. We have one and our dogs love it! We use it in the tub also to get a really good lather going on. Such an awesome tool! Thanks Kirsten, I'm not so fond of the wire brush myself!! I will have to try one of these. Elli chewed hers to pieces. But I did like it while it lasted. :) I used it primarily during Elli's bathtime. This looks similar to a brush we used to use. While it was comfortable my me and my dog, I found that it wasn't very good at removing her fur. It was also really difficult to remove the shed fur from the brush itself. Thus, we have gone back to the dreaded metal. Perhaps this one will work better than the one we had. Thanks for sharing the information. Brilliant if the dogs can stretch and relax with its use. Thanks for the review. I would think being brushed with Zoom Groom feels similar to a massage. Our short haired pups shed more than you would expect them to shed. I used a similar tool on my horses - loved it. Need to find the old one or a new one for the dogs, esp. those short haired ones :). That looks like the pawfect brush fur me! Please write me and let me know where you got it so I can nudge Mom into getting one for ME :) Great review. Thank you! I used one of these when I went to give baths to some dogs in boarding. One dog was a golden/lab mix and oh MY the hair on that dog! I've only ever bathed my own dogs and couldn't believe what a mess it was to bathe a dog with long hair! However, I got to use that brush and WOW, it was super helpful!